Lernabit helps you remember more of what you learn as efficiently as possible. With Lernabit, it is very easy to create notes about any topic using text, images, and audio. As long as you continue to review your notes every day, the information will eventually become part of your long term memory. Over the weekend I made some updates to the site that focus on the second step of that process: reviewing your notes. I made a few different changes that make the entire review process faster, easier, and more efficient. In addition, the new changes also make it easier to review notes about one specific topic. This had a number of problems. The main problem was that is was inefficient, but it was also very confusing and not intuitive. Also, the "Reviews" page would only let you review a random selection of 20 notes. With the new changes, all of the functions to add, remove, and review a note on your list are consolidated into just one button that appears on every notecard anywhere on the site. If the note is not already on your review list, the button will let you add it. Once the note is on your review list, the button will be a different color to let you know that it is time to review it. When you have reviewed it, just click "Done reviewing" and it will be brought up to date. Also, if the note is already up to date, the new button will tell you so that you know it is already on your list but just isn't due for review yet. Click "Add to review list"
Browse the site as normal. Click "Done reviewing" for anything that is due. The review button will tell you when the card is up to date. If I see this notecard in the feed, I will know that it is already on my review list but does not need to be reviewed right now. The newly designed note page showing the review button. You can also see that the new page has added the navigation menu in the left column to more easily explore notes on Lernabit. In addition to the new review button, there was also a change to how notes are sorted in some feeds to prioritize the notes on your review list. For example, when you search for a hashtag, the first notes that appear will be notes on your review list with that hashtag that are due for review. With these changes, it is very easy now to see which notes are due for review. As you browse notes, you can mark them as "complete" right from the feed. For longer notes, the entire content is not displayed in the feed, but if you click on it you will be taken to a page to see the entire note. That page now has a review button as well to mark it as "complete". One of the coolest results of these changes is that you can easily review your notes by topic. For example, to review all of my notes that include the hashtag #italian, I just search for that hashtag and see all of my notes that are ready to review. This allows me to review what I already know about that topic to help provide more background before learning anything new. These new changes will make it easier to review your notes, helping you remember everything you learn about any topic. Learn some easy tips and activities that are scientifically shown to make you smarter. 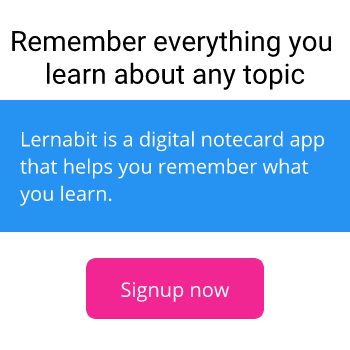 Lernabit is now a note taking app that improves on Bits by adding some cool new features. Now you can add multiple attachments to your notes with a Premium account. The ultimate guide to becoming an autodidact. A new version of the Android app is available. Now you can find educational content on Lernabit. Now you can embed YouTube videos into your notes.